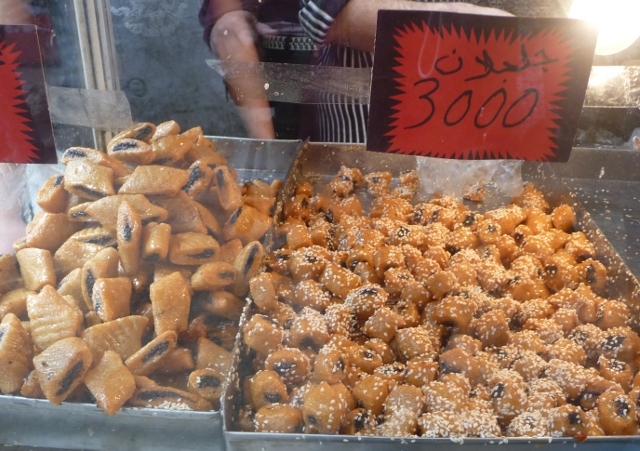 Tunisia shares elements of its food with the other North African countries, but is not known for its cuisine in its own right. A few key ingredients dominate and can be found across every region in virtually any shop or eatery, and in most of the dishes too: eggs, harissa and tinned tuna. Couscous is of course a national dish and is served quite spicy with some meat and large cut vegetables and a broth. Harissa, the Tunisian chilli-based paste provides the spicy heat and colour to most dishes. Generally in restaurants and for street food they tone it down for Europeans, so we asked for the normal Tunisian amount for a shot of heat. 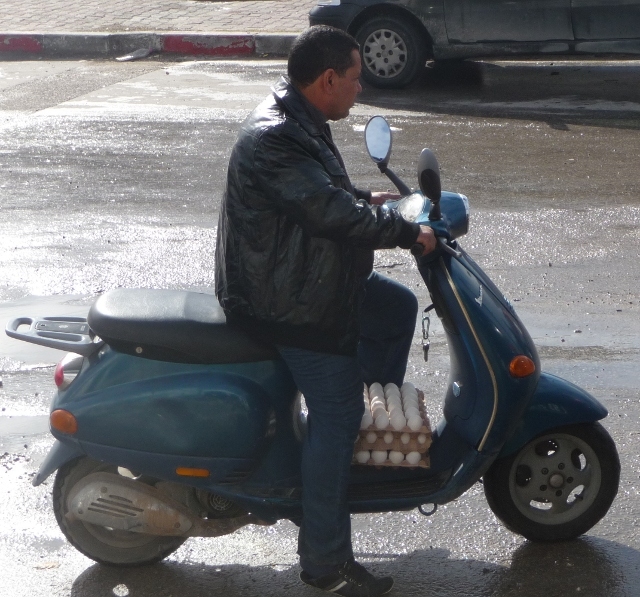 Tunisians buy huge trays of 30 eggs at a time, and they nearly always manage to slip eggs into a meal at some point. 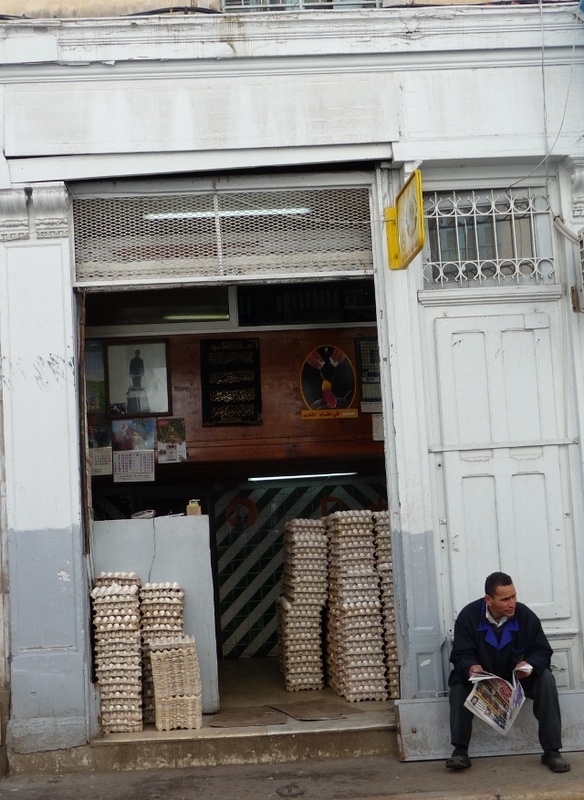 You can buy single eggs at any hole-in-the-wall grocery too. Brik a l’oeuf is one of the national dishes. It usually consists of a thin pastry case deep fried with an egg inside. When you break open the crispy wrapping, the yolk oozes out. Tuna, sometimes mashed potato, herbs and other ingredients are often added to the package. It is a delicious and ubiquitous snack and starter in almost every restaurant. 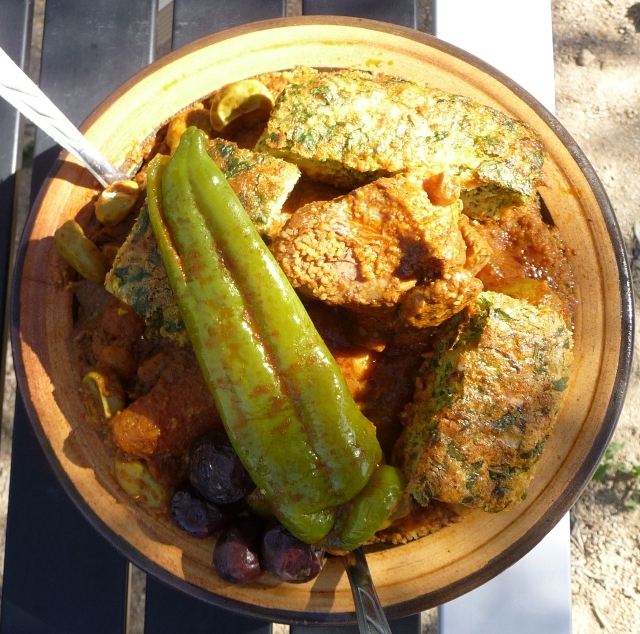 Tajine is totally different to a Moroccan tajine, not a meat stew but a baked omelette wedge (eggs again!) with meat and fresh herbs in it, sometimes served with couscous. There are lots of patisseries selling a wide range of local pastries, some so sweet and sticky your cheeks tingle. There are also more European style pastries and biscuits for sale of very good quality for a fraction of the price we’re used to in the UK. We loved the chorbas, or soups, nearly always served spicy hot tasty with vegetables, couscous grains or small pasta or vermicelli and chick peas. These were especially welcome when faced with the colder wintry weather in the north of the country. For supreme freshness, good value and tastiness you can’t beat Tunisian street food snacks although you might not get a wide choice from any one vendor. Depending on where you are, you can get different sorts of round and flat breads, some variations are called chapattis, but different to the Indian bread of the same name, and galettes, again, not a French savoury crêpe. These are generously filled with a made-while-you-wait omelette or chopped boiled egg, harissa, tuna, turkey salami, olives, mercuria – a Tunisian salad of finely chopped roasted vegetables, potatoes – all or some of these as you like. Sometimes chawarma or donor kebab style meat is offered. Always fresh and very tasty. Some cafes will also add chips and salad into your sandwich. Then there’s metabka a ‘Berber pizza’ made of flat round unleavened pan cooked dough stuffed with a spicy tomato and vegetable mixture. These self-contained lunches can cost as little as less than a pound and rarely more than £1.50 for a fully stuffed bread, leaving you feeling the same. With baguettes and round breads at around 12p a throw, breakfasts and lunches were very cheap. However, it was harder to find interesting fillings or toppings. By the time we left Italy we were bored of cheeses and hams, after a couple of months in Tunisia we were longing for them again. There are no pork products there of course and the substitute is turkey in sausages, salami and ham. These don’t necessarily taste bad or of much, but are highly processed and look unappealingly brightly coloured. Tunisians don’t seem to have the taste for cheese as we know it. There are virtually no Tunisian cheeses. The foreign cheeses on offer tend to be the blandest of the European ones, like the made for the market camembert with no taste. Widely available is the kind of UHT cream cheese that comes in quarter packets, which can be an extra street sandwich ingredient. We tried a local goat’s cheese, but it had so little taste it would make mozzarella taste like stilton! Cheese prices are the same as in Europe too. Even bland cheese was very hard to find in the south of the country and we turned to jam – which you buy in cans. Not expecting a lot from tinned jam, we were pleasantly surprised, the quince and fig varieties are particularly good, and we decant this into jars. We even bought stocks of these to take back to Italy. We also made our own omelette-in-flatbread or -galette sandwiches when we had the opportunity. Meat, in particular is no cheaper there than in much of Western Europe, so is disproportionately expensive compared with other goods and with what local salaries are. Butchers specialise in a particular type of meat and there is little refinement in the cuts – it’s just mutton or beef, usually on the bone. The bulls’ or sheeps’ heads are often hung outside the shops. You can’t fault its freshness though, in many parts of the country it’s queueing outside! Although we grew more used to this, it’s still disconcerting to see the live sheep standing underneath the hanging carcass and skins of its cohorts. We felt particularly squeamish after seeing the camel butcher in Douz with a camel’s head hanging outside and its legs neatly arranged, so soon after our camel ride. It wasn’t always possible to find a butcher with a mincer either, and the lamb merguez sausages we became fond of weren’t always available. Chicken and turkey meat and charcouterie products are sold at the specialist chicken and egg shops. Chickens are often still alive and slaughtered and plucked to order, we never had to ask for it this fresh thankfully. We ate out a lot in Tunisia as it was often as cheap or cheaper to eat out as to buy the ingredients and cook them ourselves. Restaurants are usually very good value and we enjoyed better restaurants without breaking the bank as well as local eateries where dinner for two can cost as little as five pounds. They all have very similar menus though and we braved the Arabic only ones too. Frequently the thing on the menu that’s different and takes your fancy is the one thing they don’t have. Main courses are usually couscous, or chicken and other grilled meats or fish, and chips. 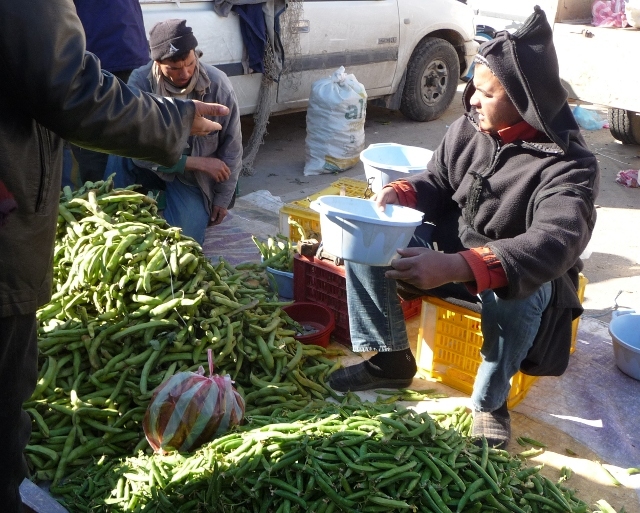 Often you’ll see Tunisian diners tucking into something different. Probably a more basic (and cheaper) local dish that they don’t think foreigners will touch, for example, lablabi. This is made of torn up bread soaked in a chick pea broth to which the usual ingredients are added to taste – an egg being served raw on top for you to scramble into the mix yourself – actually much more delicious than it sounds. Supermarkets are almost non-existent outside larger towns, but there are ‘hole-in-the-wall’ grocers everywhere. 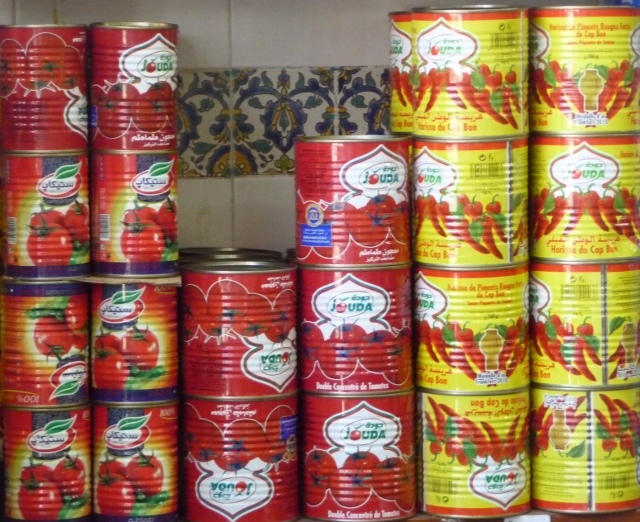 These can vary from shops that sell a very small number of a narrow range of products to well-stocked Aladdin’s caves stuffed with tins piled high (harissa, tomato puree, jam and tuna mainly), sacks of dry goods (couscous, rice, flour, chickpeas, spices), chiller cabinets groaning under margarine and yoghurt, and canned and bottled soft drinks, bread and trays of eggs, and any number of household products. In grocery stores you usually have to request things over the counter rather than wandering around and browsing, comparing prices and generally getting a feel for what’s available. This means you have to know what you want and it’s not always easy to know in advance what you want as this is dependent on what they have! The chaotically colourful arrays of fresh fruit and vegetable shops and markets overflowing streets are a mainstay. Everything that is in season is available very cheaply. You usually get a grubby faded plastic bowl to fill yourself with whatever takes your fancy, then it’s weighed usually on old fashioned weight scales. Carrots, peas, turnips and fennel were very much in season while we were there. You can ask for a slice of a pumpkin or a squash which they have sitting on the counter. The highlight of Tunisian produce though was for us the wonderful oranges available by the truckload, both for eating and for juicing. We will miss the freshly squeezed orange juice we were making or buying every day. 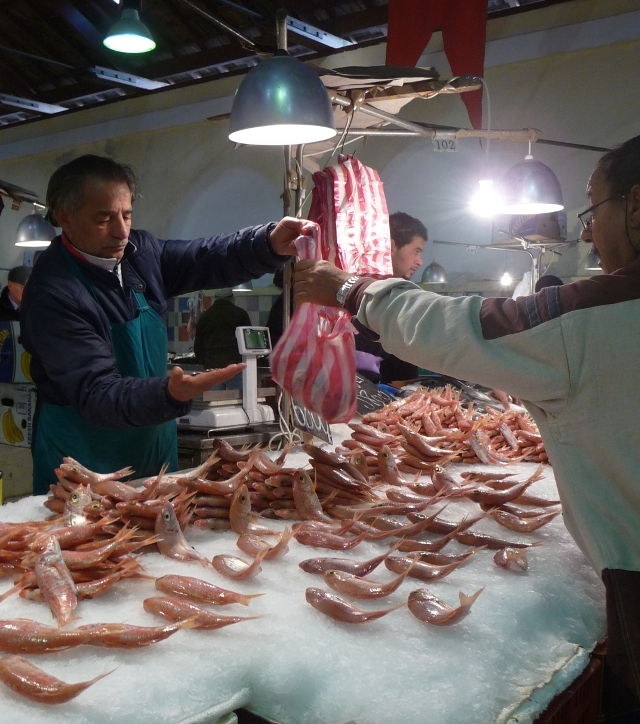 Most larger towns have a market hall and nearer the coast, the fish is abundant, beautifully arranged on the counter and cheap in restaurants – often grilled outside on the street. 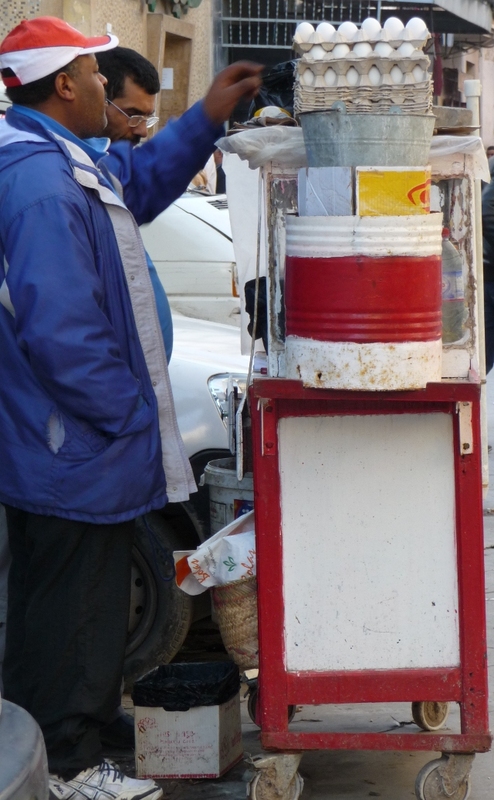 Alcohol is not prohibited in Tunisia as it is in many other Islamic countries and Tunisia produces its own beer and wine. However, it is far from being freely available outside tourist hotel bars and restaurants, and we chose not to hunt it down. We were able to sample a few rather pleasing local wines though, and the drinkable local beer Celtia on occasion, but we were almost alcohol free for two months. 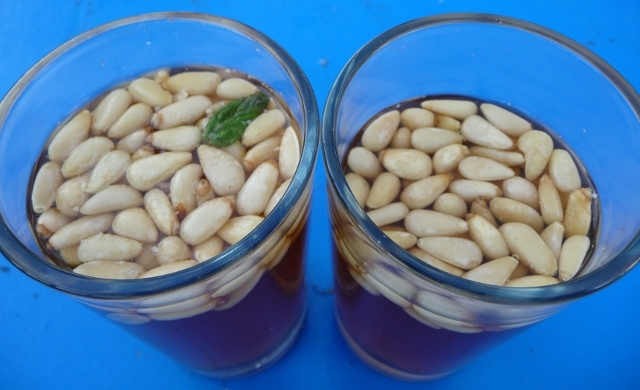 The orange juice mentioned above, and the ubiquitous sweet tea, sometimes with mint and/or pine nuts have been our tipples of choice when out at cafés. After two months in the country, sampling its various dishes many times and using its ingredients to cook our own meals, our palette became somewhat jaded and we have already embraced the delights of Italian cuisine once again. The low fat and almost non-existent alcohol in our diet in Tunisia did have further pleasing effects on our waistlines though. This entry was posted in By Country - Tunisia, Food stuff. Bookmark the permalink.